The Samsung Galaxy A3 may look like one of the brand's more high-end smartphones, but it is surprisingly affordable, making it attractive for anyone who wants the Samsung name without the price tag. 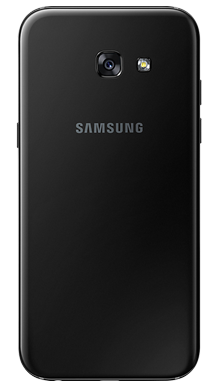 Select your desired options to find the best Samsung Galaxy A3 2017 deals for you. While Samsung is widely regarded as one of the world’s best high-end smartphone manufacturers, the brand also delivers some incredible mid-range handsets which are much kinder to the bank account. The Samsung Galaxy A3, in particular, is a fantastic choice for anyone who wants to get their hands on a Samsung handset without paying through the roof. It combines beautiful design and powerful technology to deliver a handset that won’t fail to impress, especially when you find out about the price! 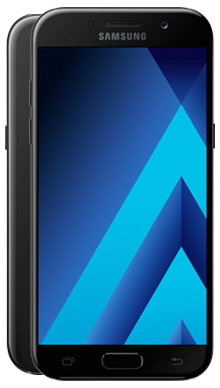 The Samsung Galaxy A3 has been designed with surprisingly premium feel, particularly when you consider that it is one of the more affordable Samsung handsets. It features an all metal frame and glass body that looks extremely sophisticated, and the rounded curves of the corners give the phone an elegant and expensive feel. 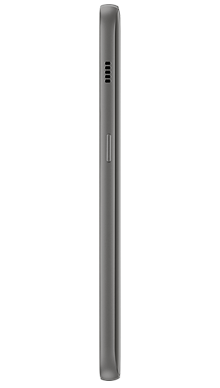 The curved 3D glass back of the handset makes it extremely comfortable in hold; it sits perfectly in the palm of the user's hand, and the compact size makes it easy to use. The added bonus of Gorilla Glass 4 make for a robust phone, and dust and waterproofing make it even more durable. If style is your concern, then you’ll be pleased to know that the handset comes in black, blue, gold and pink, so you are sure to find a Samsung Galaxy A3 to suit your own individual style. The front panel is a 4.7-inch screen that houses the ever impressive Super AMOLED technology. Colours come across well balanced, and the A3 handles saturation and brightness very well. There’s the option to easily personalise the display to suit your own preferences; we found that ‘basic’ tends to be the most popular option. The small, single speaker on the Samsung Galaxy A3 isn’t the most powerful when you’re listening to music without headphones, but we wouldn’t particularly expect an overwhelming stereo speaker on a phone at the price point. When you use headphones, however, the audio experience is more than acceptable, and the A3 handles a range of music files very well. The Samsung Galaxy A3 is equipped with an impressive 13MP rear camera that consistently delivers impressive photographs. There’s the opportunity to enhance and edit your shots with some creative additional features such as HDR, Pro and Beauty mode to ensure that your photos are looking just the way you desire them to. There’s an equally impressive 8MP front-facing camera to allow you to capture perfect selfies, so if your a self-confessed social media addict, the A3 won’t disappoint. The A3 comes with 16GB of internal storage on board with 2GB of RAM, so there’s plenty of room for all of your favourite apps, files and photos. However, if you’re in need of more storage, then you can use a micro-SD card and get up to 256GB of storage. Reassuringly the A3 runs on an Exynos 7870 processor to deliver a smartphone experience that is more than satisfactory and handles the technology of the A3 very well. There’s a decent 2350mAh battery cell that will see you through a day’s moderate use, but if you’re constantly attached to your smartphone then you may want to power up before the end of the day. 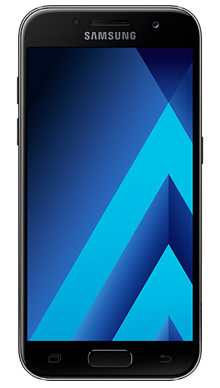 Metrofone is dedicated to bringing our customers the very best mobile phone deals, meaning that we, of course, have some of the very best Samsung Galaxy A3 deals. We’re confident that you won’t find a better price anywhere else. 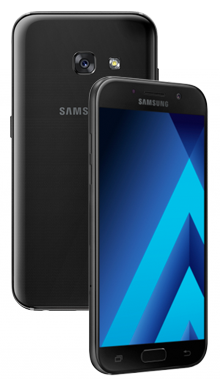 We have a huge range of the very best Samsung Galaxy A3 deals on our site, with some great added extras to complete your new pay monthly contract, whether you’re looking for bags of data, great perks or even the odd cashback offer. We partner exclusively with EE because we know that they are the UK’s very best mobile phone network, and we can rest assured that all of our customers receive the best service and connection regardless of where they are. If you can’t find the best Samsung Galaxy A3 deal online or in our stores, then why not contact us on 0333 900 1144 and our UK based customer service team will be on hand to guide you to the perfect deal for you.